Damaging vibration, shock and unwanted noise are a fact of life with rotating and oscillating machinery. Both shock and vibration can cause moderate to severe damage to equipment - increasing operating costs, reducing productivity and adversely effecting part quality. Learn how Sorbothane damps vibration. The Sorbothane, Inc. engineering team developed a formulation to make Water-Resistant Sorbothane® impervious to moisture while keeping in tact its ability to handle impact and isolate vibration. Learn more about the features and benefits of Water-Resistant Sorbothane®. 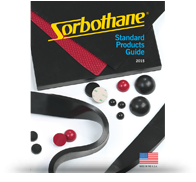 Sorbothane® Sheet Stock offers a quick and effective method for isolating a wide variety of loads and equipment. It is available in a variety of sizes, from 4” X 6” to 25” X 25”, and a wide range of thicknesses and durometers. Sorbothane® is the perfect impact absorbing material that can be used to create an impeccable anti vibration pad. Sore and bruised shoulders are common in the shooting sports. Recoil can cause discomfort, pain and make second shots less accurate. Sport shooters and hunters can easily fire 100 rounds in a day - during practice or competition. To absorb the impact of recoil, entrepreneur Willard M. Latimer created the Sorbothane® KICK-EEZ® Pad. The KICK-EEZ® Recoil Pad is the only pad made of Sorbothane®, a viscoelastic polymer that has been medically and scientifically proven to be the finest cushioning material available. Learn more about this custom solution. Design World technical and editorial staff decided to test the impact protection of Sorbothane® by dropping a raw egg, enclosed in a Sorbothane® case, from the ceiling of their converted warehouse offices in Cleveland, Ohio. It worked! Learn more about Sorbothane® and its damping abilities. For over 34 years, Sorbothane® Insoles have proven to be the best defense against foot pain and impact-related injuries. Manufactured in Kent, Ohio, Sorbothane® Insoles have quickly gained worldwide recognition by providing comfort and delivering long-lasting cushioning. Learn more about the development of Sorbothane® Insoles. Sorbothane partnered with the United Auto Workers, in Ypsilanti, to design and produce a long-lasting Sorbothane® SOFT-BLOW MALLET that would make clean contact with the accessories being installed without marring or denting the freshly painted body panels. This saved the plant time and repair costs. 11-year-old Rachel suffered an impact related hip injury and was forced from the ice for over a year. Her injury and time on the sidelines prompted Rachel to seek out safety gear that would enable her to practice new skills fearlessly, and with reduced risk of injury. Motion is present in all industrial automation systems. Stopping or changing the direction of that motion releases kinetic energy, which can cause shock and vibration to occur. Any sudden shock in a system can cause immediate damage to the overall machine and the components it may be manufacturing or processing. Consistent vibration inputs can cause damaging fatigue over time. This is why it’s necessary to decelerate a system smoothly through the use of shock and vibration attenuation components. Sorbothane® is a unique material that, combined with proper ergonomic design, cradles the foot in comfort and helps protect the entire body by absorbing up to 94.7% of impact shock. Sorbothane won’t bottom out like other insole materials. Durable and long lasting, Sorbothane Comfort & Performance Insoles ensure cushioning and protection step after step.